I’m happy to announce that I’ve teamed up with a few friends and launched a new startup. It’s called Grove Ave, and our mission is to empower individuals who want to achieve more. Through our products, content, and tools, we aim to help our customers accomplish their goals. Right now, we’re in the early stages of validating and testing some product concepts. It’s been a great learning experience as we’ve been going back and forth with manufacturers and experts in various areas to help inform our decisions. In the coming weeks, we’ll be running experiments to see if some of our product ideas can gain traction and find a market. There’s a ton of work to be done, and I look forward to documenting our progress both on this blog and elsewhere. For now, I wanted to share some of the things we’ve been able to accomplish, how we’ve been going about doing our work, and a peek at some of the behind-the-scenes action. Grove Ave is inspired by a long road in Edison, NJ. There are five of us who currently make up Grove Ave, and four of us grew up in Edison. We chose Grove Ave to remember our time together at John P. Stevens High School (its address is 855 Grove Avenue), where we became close friends and pursued many productive activities in academics, athletics, club activities, and even in entrepreneurship. Four out of five members of Grove Ave went to J.P. Stevens High School in Edison, NJ. Highlighted from left to right: Andy, Welton, Peter (me), and Warren. We liked the idea of a grove, a small group of trees that grow close together, and how much all of us value the idea of growth. As we first floated the idea of building a business together, we kept coming back to creating products that would help customers pursue growth, both in their personal and professional lives. A screenshot of the artboard where I explored variations of the Grove Ave logo design. For the logo, we sought to find a symbol that would represent growth. We checked out Wu Xing, the system of five phases/elements used in traditional Chinese philosophy to describe how the world works. We examined the five elements—Wood, Fire, Metal, Earth, and Water—and felt that Wood, which signifies growth (feeding Fire, putting down roots, etc.) and is associated with Spring, was an appropriate element for Grove Ave. As we dug deeper, we saw that Wood corresponded with Wind (巽, Xùn) one of the eight trigrams of the I Ching, the Book of Changes that is the oldest of Chinese Classics. 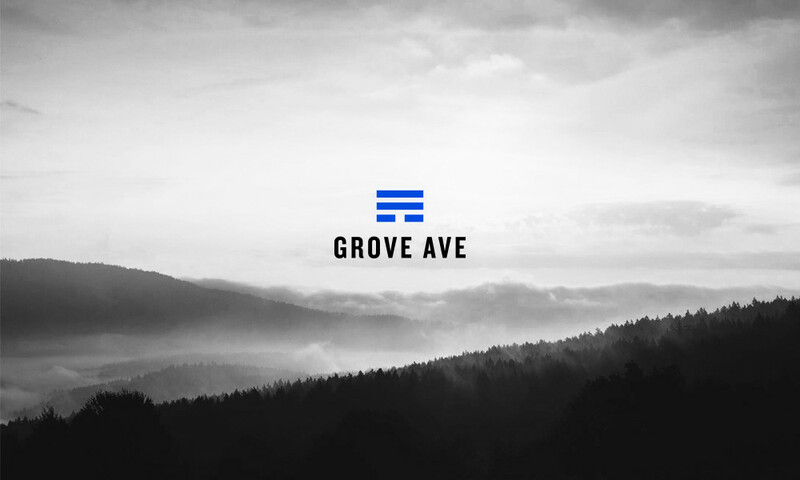 We loved the simplicity and geometric quality of the symbol and adopted it as part of the Grove Ave logo. I have to note that Grove Ave is something we’re all doing on the side. We all maintain our full-time careers, and we’re really curious to see how we can make this business grow while sticking with our other commitments. Will this ultimately cap our potential or keep us from making this into something big? Perhaps. But the fact that it’s a side hustle doesn’t mean that we’re not taking it seriously. In fact, I’m pretty proud that we’ve been fairly disciplined about everything so far. Left, a rare in-person meeting to hang out and talk business (minus Welton) in New York. Right, a screenshot of our weekly Google Hangout call. Grove Ave work usually happens during breaks, after work, or on weekends. To keep things moving, we’ve established a workflow that keeps us accountable for tasks each week. On Sunday mornings, the five of us log on to Google Hangouts and have a very productive 90-minute session. We review what we’ve accomplished in the past week and what we should focus on for the coming week. We also talk through different topics most pressing at the time (e.g. branding, product selection, legal stuff, etc.). All updates and decisions we make are logged and posted on Basecamp, which we also use for general file and resource sharing throughout the week. We knew that it was going to take some time to come out with our first product. We have a general idea of what the product will be, but there’s quite a bit of research, testing, and prep work we still need to do. So while our product development track continues, we decided to get some smaller wins and launch a few things incrementally. Over Thanksgiving last year, Welton and I talked about a potential e-book for Grove Ave and how we could use it to grow our email list. A few hours later, Welton already had 5,000 words down and a fully developed outline for a book on productivity. We worked on some edits and continued to refine the manuscript over the next few weeks. Grove Ave website design in progress. Thankfully, I have some experience designing websites. In the meantime, after developing the logo and having discussions that helped us finalize our mission statement and tagline, I carved out some time to work on the website design. It would be a simple landing page to collect emails, but I wanted it to have a distinct look. Using free stock photography from Unsplash and playing around on Adobe Illustrator, I mocked up the homepage and shared it with the guys. Some weeks later, Sei-Wook re-familiarized himself with front-end development after five or so years away from the game and coded the designs. I had to look up tutorials for Adobe InDesign to properly lay out the e-book. I dedicated a couple weekends to laying out the book in Adobe InDesign and had to read up several tutorials and watch YouTube videos to properly set Welton’s writing into a proper e-book format. It was very rewarding to see the book take shape. We generated a 3D book image of the e-book to use for marketing purposes. It’s really easy to create one on boxshot.com. 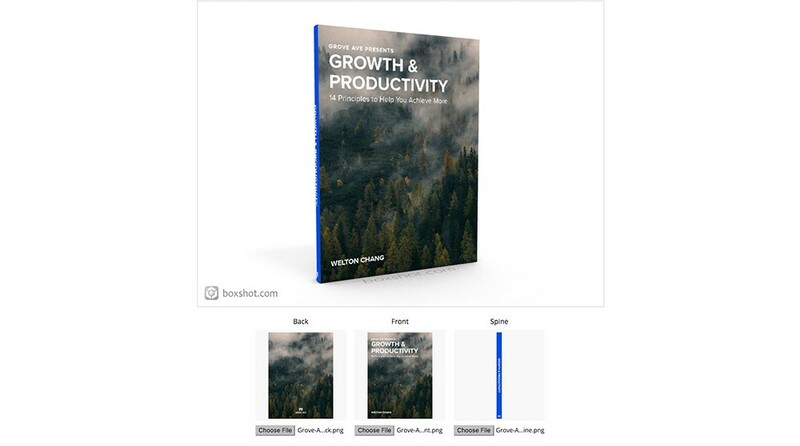 Once the e-book was ready to go, we generated a 3D cover graphic on boxshot.com to make it look like a real product. We then spent some time last week setting up our email marketing. We’re using MailChimp, and I spent half a day setting up the designs for the email template and making sure the flow for signing up and downloading the e-book made sense. Sei-Wook set up Google Tag Manager and Analytics to make sure we’re tracking everything. I also created the first email campaign, which kicked off our weekly mailing, a bulleted list of five things people should read/listen to/watch that relate to personal and professional growth. 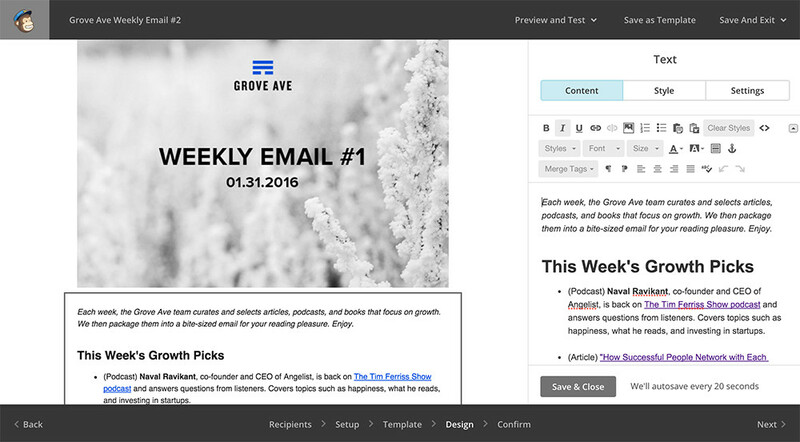 Putting together a newsletter campaign in MailChimp. There was no big fanfare to our launch. We posted it on our respective Facebook accounts and texted/emailed friends. We’re gathering feedback and will start putting a plan together to do a more substantial marketing/PR push. For now, Welton’s been posting excerpts from the e-book to Medium, and I’m trying to streamline a process to make sure our weekly emails go out. Finalizing our product, setting a price point, figuring out distribution, and getting our marketing plan in place will be our next big milestones. I can’t say exactly when this will be, but I know that we’ll be making progress on it every week. Some pics of J.P. Stevens High School buddies over the years (early 2000s for the first two from the left and 2015 for the last one). I think we’ve aged very well! And here’s the big-picture takeaway I’ve been thinking about from doing Grove Ave. I know it’s early and it’s not a full-time gig, so the stakes are fairly low. But at the same time, we’ve all invested time and energy into this. We’re also investing our own money to get things off the ground. What I’ve cherished is the fact that I get to connect with my buddies several times a week and work together towards a shared goal. I’m already quite blessed in that I get to go to work everyday at Barrel with one of my closest friends in Sei-Wook, so I feel doubly blessed that in my free time, I get to work on stuff with my lifelong buddies, crack jokes together, and share in whatever gains we achieve. Whatever may come of our endeavor, I know I’ll savor the journey and have a good time.